fishing, or hiking right on this virgin forest property. Electric radiant floor heating beneath stone floor in bath and kitchen, fireplace with firewood, ceiling fans on deck/porch overlooking 81-acre lake, private swimming dock, canoe, and (in June, July & August) an enclosed outdoor shower w/dressing room... all included. Loons to serenade you. Moose to entertain you. Antiquing, whitewater rafting, gold panning, sightseeing, gemstone prospecting, many splendid hiking options, good bicycling, wild orchids, fishing, moose, deer, beaver and other wildlife and much more. 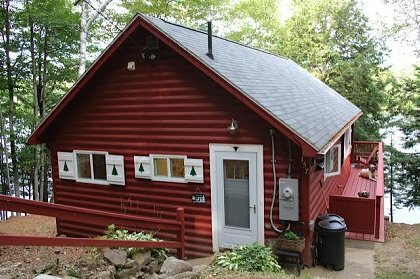 The Guest Lodge is just 40 feet from the lake. Photo taken by John D. Silva - an acclaimed outdoor writer, photographer and humorist who is an annual Lodge guest. The great room or living room has a beautiful stone fireplace, built by hand with all stones found within 20 miles of the Lodge and none hewn. 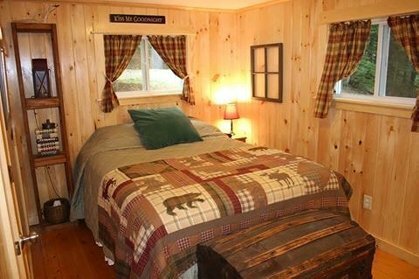 Bedroom with queen-size bed and door to bathroom. 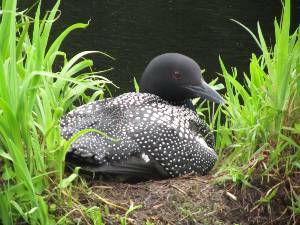 Every year, Mr. & Mrs. Loon return to the lake to use this floating nest. Photo taken by Beth Bull in May 2012. Santa Claus Lake...an 81-acre lake just 40 feet from the Guest Lodge deck. Window looks out to lake. Kitchen includes full-size refrigerator not in view. Radiant heating beneath tile floor. We stumbled upon this gem in 2002, and have been back several times over the years. The loss of Mr. Bull was heartbreaking, but one can still feel Tall Pine Bull's spirit. The Guest Lodge is a spot of serenity, of truly getting away, of reflection, any time of the year. We always leave a bit of our hearts whenever we leave. Just returned from a wonderful week at the guest lodge at Santa Claus lake. What a wonderful place. Enjoyed every minute we were there... Didn't want to leave. The lodge was ever so comfortable. No tv was the best! Movies and books were great, spent a day reading the many years of guest book writings and enjoyed reading the planning and building stages of the lodge too. Fireplace was enjoyed during a few days of rain. Never felt the need to leave, enjoyed time with family and friends. Hiking, picture taking, relaxing, and enjoying nature at it's finest! Thanks Rob and Beth for allowing me to create the past weeks wonderful memories and enjoy this special time with family & friends. As you may have seen from other postings my father Robert L. Bull passed away quite unexpectedly in Feb. 2008. We all miss him terribly! Those of you who have stayed at the lodge prior to 2008 know him well as he thought of each of you as extensions of our own family. My wife Beth and myself are doing all we can to keep the Lodge open. Many of you have written us expressing how the lodge has become such a part of your family that it is almost like a second home to you. We have guests now who grew up coming to the lodge when their parents brought them, and now they come with their spouse and children. My father cherished, friends, children, and the nature that is all around Santa Claus Lake, and shared it with great excitement. I am sorry he will no longer be there to greet each of you, to share the fruits of his garden, and as we now live out of state we may not be able to be there either. 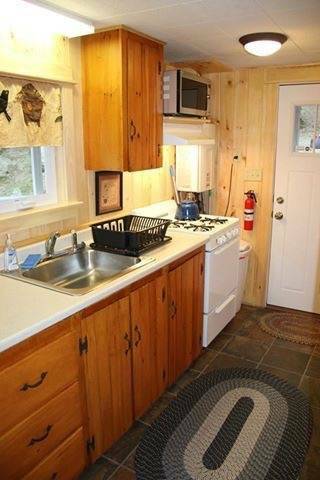 But know the Guest Lodge at Santa Claus Lake remains open for rentals, with many repairs and upgrades in the past few years to help make your stay more enjoyable. We thank you all for over 40 years of come to share in our Guest Lodge. This is truly a small slice of heaven right here in ME. The Bull family has has made me feel more like family, than a guest at the Lodge, for ten years now. Regretfully, Mr. Bull pass away this srring, but his son, Rob Bull, will carry on the tradition of offering up this special place for visitors like me, hopefully, for many years to come. My time spend here is the most relaxing two weeks of the entire year, without a doubt! Thank you Bull family for years past and years future! Stayed her in the 1970's and 1980's. It looks like the location hasn't changed. It's still pristine and beautiful. 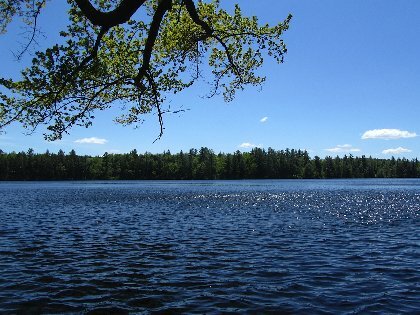 If you love to relax; if you love to hike, if you love to fish; this is it! Robert Bull was always super nice to me and my siblings, as children. I wish I could get back here/there. we just returned from this property where we spent a week 7/5-12 and had a lovely time. 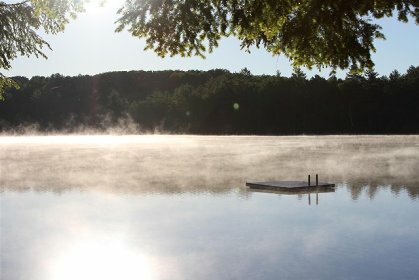 if you are looking for a private vacation on a beautiful, clean lake, uninhabited by tourists, this is a wonderful find. we enjoyed ourselves relaxing, fishing, swimming and and especially escaping from city life as did our dogs who were free and safe from city traffic. we will return soon. 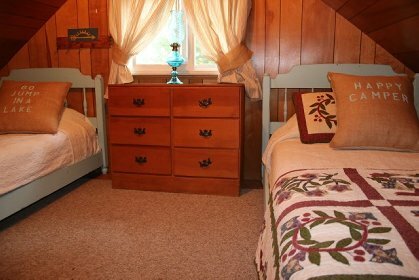 My stay at the guest lodge at Santa Claus Lake exceeded my recommendations in every regard. The lake itself is spectacular. Motor boats and jet skis are not allowed on the lake so it is an oasis of quiet beauty. There are few cabinsxor homes on this lake. With very few exceptions either I or my son and I were the only people on the water when we swam, fished, or used the canoe and paddleboat. A pair of loons make their home on the lake. Their haunting cry is one I will never forget. I took the paddleboat out at dusk on a clear day and paddled to the middle of the lake. There I sat and watched the sun go down, darkness descend, and the stars appear. Because there is no artifical light, the stars were truly marvelous. I will never forget my stay at Santa Claus Lake and plan on returning there if the future. We have just returned from a one week visit (June 4, to June 11,) at the Guest Lodge on Santa Clause Lake and we can't recommend this property enough. The facility was clean, well maintained, and very comfortable. We were treated like royalty by Mr. Robert Bull, the property owner. 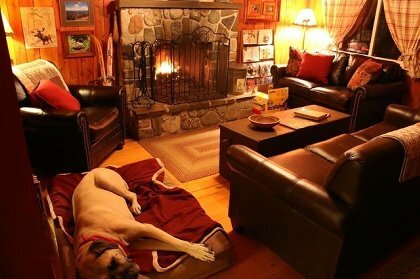 Mr. Bull thought of every possible comfort and convenience in setting up this property. We hope to make our stays at Santa Clause Lake a yearly event. It was a long trip from Richmond, VA. but worth every mile. If you choose this property I am sure you too will be well pleased. Cancellations and Refunds: Deposit refunded at 80% with 21 days notice. No refund with less than 21 days notice. Other Fees: Rate includes 2 people - each additional person is $50 per week. Housebroken dogs are welcome but $100 per week extra cleaning charge is added. (No cats allowed.) Full rent must be paid by day of check in. 50% deposit required when making a reservation.